From the bestselling author of It Happened at the Fair comes a historical love story about a lady doctor and a Texas Ranger who meet at the 1893 Chicago World’s Fair. Saddled with a man’s name, the captivating Billy Jack Tate makes no apologies for taking on a man’s profession. As a doctor at the 1893 Chicago World’s Fair, she is one step closer to having her very own medical practice—until Hunter Scott asks her to give it all up to become his wife. Despite their difference of opinion on the role of women, Hunter and Billy find a growing attraction between them—until Hunter discovers an abandoned baby in the corner of a White City exhibit. He and Billy team up to make sure this foundling isn’t left in the slums of Chicago with only the flea-riddled, garbage-infested streets for a playground. As they fight for the underprivileged children in the Nineteenth Ward, an entire Playground Movement is birthed. But when the Fair comes to an end, one of them will have to give up their dream. Will Billy exchange her doctor’s shingle for the domesticated role of a southern wife, or will Hunter abandon the wide open spaces of home for a life in the “gray city,” a woman who insists on being the wage earner, and a group of ragamuffins who need more than a playground for breathing space? "The glitter and excitement of the 1893 World's Fair—depicted in charming photographs interspersed with the text—is the colorful backdrop for Gist's novel, which pits a determined woman doctor and a Texas Ranger in a battle of wills that's brighter than any fairground fireworks. Gist delivers a lovely story brimming with touching emotions and carrying a message about love, commitment, and our duty to care for children that will resonate with readers." 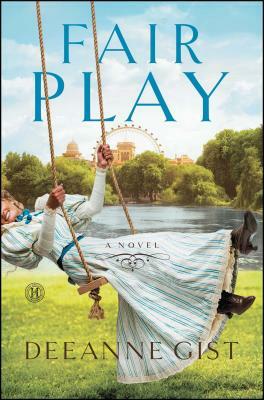 "Gist seamlessly incorporates fascinating historical details about the 1893 World’s Fair and Chicago into Fair Play, which not only tugs at readers’ heartstrings but also shows how the seeds of the national playground movement were sown. Fans of both faith-based historical romance and historical fiction will be delighted with this entertaining addition to Christy Award–winning Gist’s World’s Fair trilogy." "Fair Play charms the heart and warms the soul. Deeanne Gist is an absolute treasure!" “[I] laughed so hard at their first full scene together I cried my mascara off."